Deputy Prime Minister and Finance Minister Kim Dong-yeon on Thursday vowed assertive fiscal measures regarding the nation‘s widening income disparity, extending his concerns for the Moon Jae-in administration’s income-led growth initiative. The top economic policymaker, however, toned down on his disapproval of the nation‘s fast-paced legal minimum wage hike plan, which he regarded as a hindrance to employment and income distribution. “The decline in earnings in low-income clusters and the widening income inequality are issues which we take very seriously,” Kim said in a ministerial meeting on pending economic issues, held at Seoul Government Complex. The minister also called for both short-term and mid-term fiscal measures to address income inequality, suggesting that next year’s state budget and tax policies may be adjusted for the purpose. ”One should note that many of the income distribution problems are due to structural reasons and thus may not be solved in the short-term perspective,” he added. Kim‘s remarks were largely taken as a compromising, conciliatory gesture as while he underscored the critical flaw of Moon‘s income-led growth, he also pledged to take leadership for improvement. The high-profile meeting was attended by related ministers -- Minister of SMEs and Startups Hong Jong-haak, Minister of Employment and Labor Kim Young-joo, Minister of Health and Welfare Park Neung-hoo -- as well as Hong Jang-pyo and Kim Soo-hyun, the senior presidential secretaries for economic affairs and social affairs, respectively. The attendance of the Blue House officials at the ministerial meeting marked a contrast to Minister Kim’s sudden absence from a Cabinet meeting and a separate meeting with Prime Minister Lee Nak-yon on Tuesday. Though he had cited health reasons, the minister’s move came amid escalating strife with the rest of Moon’s economic team over the minimum wage hike. Seeking to promote fair economic order and income-led growth, the Moon government increased the legal minimum wage by an unprecedented 16.4 percent to 7,530 won ($7) from 6,470 won, as part of a mid-term plan to raise the minimum wage to 10,000 won or more by 2020. But following a quarterly survey by Statistics Korea announced late last month, which showed a widening income gap here, controversies arose over the effectiveness of the drastic wage change. 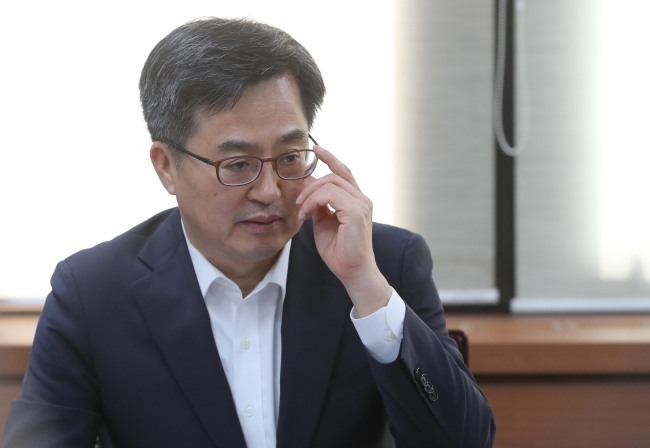 While President Moon, backed by presidential chief of staff for Policy Jang Ha-sung and Fair Trade Commission Chairman Kim Sang-jo, continued to push ahead with the set timeline, Minister Kim was questioned the pace of the plan. Reflecting such concerns, the Korea Development Institute, a think tank affiliated with the ministry, suggested in its recent report that the job-cutting effect of the wage change could expand exponentially in the upcoming years, calling for an incremental approach. The report was almost immediately refuted by some experts including Lee Sang-heon, employment policy director at the International Labor Organization, who said that the KDI had made a flawed analysis. Aware that the expanding dispute would blur the Moon administration’s policy drives, however, both the presidential office and the ministry recently set about bridging their gap. “It is difficult to assert (the full impact of the wage hike) upon the analysis of a single quarter,” Kim told reporters on Tuesday. The Blue House also responded favorably to the financial chief’s change of tone. ”The low-income bracket problem weighing heavy on the government,” said presidential spokesperson Kim Eui-kyeom in a press briefing.